Ford is expanding its GoRide medical transport service through a new partnership with the Detroit Medical Center. Ford Motor Co. is partnering with the Detroit Medical Center to expand a medical transport service it piloted late last year. The Dearborn-based automaker now offers its GoRide service at the health system's Detroit Receiving Hospital, Children's Hospital of Michigan, the Rehabilitation Institute of Michigan, Sinai-Grace Hospital, Huron Valley-Sinai Hospital, DMC Heart Hospital, Harper University Hospital and Hutzel Women's Hospital, as well as approved physician partners, according to a Ford news release. The service, delivered by specially-outfitted Ford Transit vans, offers bedside-to-bedside transportation and wheelchair accessibility with a 97% on-time pickup rate, according to Ford. It will pick up and deliver from homes, nursing homes and medical facilities. GoRide is part of the automaker's Ford Smart Mobility LLC, which aims to invest in and grow emerging mobility services. Ford joins other ride-share services, such as Uber, Lyft and SPLT, that have deployed medical transport services in metro Detroit. GoRide was rolled out this spring at Southfield-based Beaumont Health after a pilot late last year, Automotive News reported. Ford plans to operate 60 vans in the Detroit area by the end of the year, with more than 200 facilities included in routes. The average trip costs $45-$60, Auto News reported. Patients can schedule rides up to 30 days in advance of an appointment. "Too often, patients miss medical appointments simply because it's too hard to find transportation they can consistently count on," Marion Harris, vice president of Ford's Mobility Business Group, said in the release. "GoRide tackles this problem by providing a human-centered service that is reliable …"
Drivers receive "extensive training" in safety, sensitivity and patient rights, according to the news release. They are trained in CPR. Ride booking with DMC is handled by the health system in coordination with GoRide. Patients with appointments at DMC can schedule a ride by calling (248) 489-5150 or visiting goride.com/health. 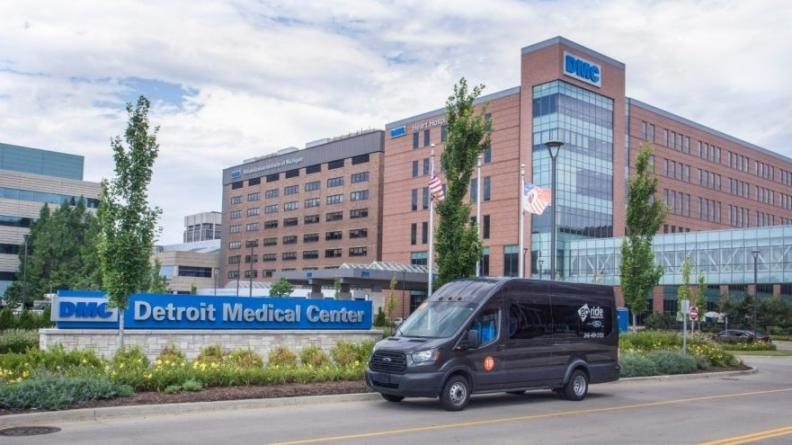 "Ford expands GoRide medical transport service with DMC partnership" originally appeared in Crain's Detroit Business.